Do you know myths vs. realities of entrepreneurship? More than 500 entrepreneurs, business leaders and students recently convened at The NIIC Ideas@Work Event at the Parkview Mirro Center for Research and Innovation to be educated and inspired on the topic. “This year’s event exceeded our expectations, thanks to our sponsors who helped make the event possible and also the entrepreneurs, innovators, educators and students who invested time to attend the event. We wish Jentri Cripe the best as her vision for Spread the Sparkle continues to evolve and encourage all NIIC Student Venture Lab clients as they are building their businesses,” stated Karl R. LaPan, President & CEO, The NIIC. The funds raised from the event will help support the Student Venture Lab Program and the Women’s Economic Opportunity Center (WEOC). This annual event is led and made possible by the Ideas@Work Event Committee, including: Chris Rush, The DeHayes Group, and Committee Chair; Tammy Allen, The NIIC; Mike Altendorf, Do It Best Corp.,and The NIIC Board Chair; Tyler Binkely The Bradley Group; Otto Chang, PhD, IPFW; Phil Downs, PhD, Southwest Allen County Schools; Mike Fritsch, The NIIC; Karl R. LaPan, The NIIC; Tammy Sipe, The NIIC; Daryl Yost, PhD, The NIIC. Remember to save the date for the fifth annual Ideas@Work event for April 17, 2018, at the Parkview Mirro Center for Research and Innovation. The NIIC is a non-profit, community-based entrepreneurial community. We assist business builders and entrepreneurs to launch, expand, or re-invent successful businesses and ventures in Northeast Indiana. 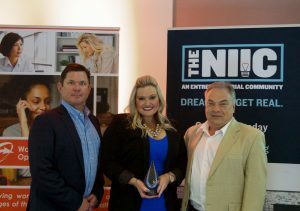 Formed in 1999 by a consortium of community and government leaders and organizations in 2013, The NIIC was recognized by Entrepreneur Magazine as one of the top four under-the-radar incubators in the country. This basically means Entrepreneur magazine, with the help of International Business Incubation Association, picked four U.S. incubators to highlight, and we were one of them. In their words, we “stand out in a state not always perceived as small business friendly.” The NIIC is the country’s only ISO9001: 2008 registered business incubation and acceleration program. For more information visit: www.TheNIIC.org.